Eating For Your Cycle is a method that women are using to customize their nutrition to their cycle. It’s used to balance hormones and help with a variety of different women’s health issues from endometriosis, PCOS, PMS, to bad cramps and fertility issues. Have you ever gone to your doctor for a hormone-related health issue and the only solution they provide you is the pill? Or if you’re struggling to conceive, fertility drugs seem to be their only recommendation? It’s plain to see that pharmaceuticals won’t heal the root of your hormone imbalance, only mask it while you’re taking the pills. This isn’t a true solution to your problems, and may be detrimental to your long-term health goals. Although your doctor may not be aware of a way to use food to balance your hormones, it’s a method that yields results for so many women. The body requires different nutrients from food to build and detoxify each of your hormones. Hormones in the female body shift according to the menstrual cycle, which is broken up into 4 phases. Eating different foods to help the unique hormone balance in each of the 4 phases is a great way to get results. This nutritional method will help you maintain a healthy balance of progesterone and estrogen so you can reduce or eliminate PMS, increase fertility and even bring back your period. Track your cycle- In order to eat for your cycle you always need to know where you are! Your period is obvious, and the other phases have telltale signs as well. Tracking your cycle will allow you to accurately match your nutrition with your menstrual cycle. Of course if you have a 28-day cycle you can keep it simple and eat for the menstrual phase for 7 days, follicular for 7, ovulatory for 7, and luteal for 7. Keep Your Uterus Warm- During your menstrual phase, commit to exclusively warm foods like porridge or an omelette in the morning and your favorite soups and stews for lunch and dinner. You can also choose foods that give your body what it needs to replenish your lost blood, like beets. Why not have borscht or a miso soup? Feed Your Follicles- In the follicular phase include omega 3 anti-inflammatory fats to support the development of the follicles that your body is preparing to release. Make meals with salmon, cod and some tasty steamed veggies. Bean salads are great, especially if you are vegetarian. Detox Excess Estrogen- You want to have lots of raw, fibre-rich veggies and lighter foods during the 4-day ovulatory phase. Fibre helps move hormones out through your digestive tract, and your body needs to shed any excess estrogen to prevent PMS later in your cycle. Enjoy a cabbage or jicama slaw with a side of lean protein or a simple kale salad! Boost Progesterone- The luteal phase is the time to support progesterone, which is dominant in this phase. Include foods high in B6 like sunflower seeds, radishes and turkey. Yams provide excellent building blocks for progesterone, and magnesium-rich greens will help reduce PMS symptoms. 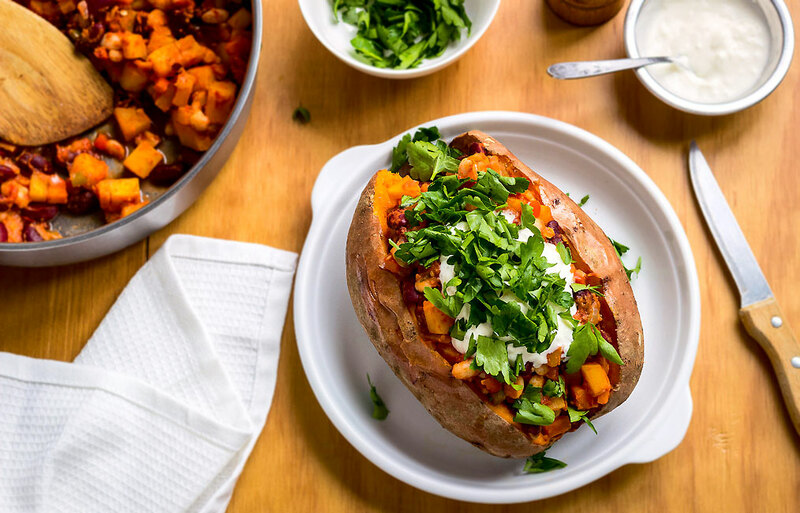 Here’s a recipe that’s ideal for your luteal phase: a delicious baked sweet potato with vegan toppings that you could have for an easy weeknight meal. To bake small sweet potatoes, rinse them and pierce several times with a fork. Wrap them in foil and bake in the oven at 350F for 45 minutes or until very soft. While your sweet potatoes are baking, roast the cauliflower for 20 minutes (tossing after 10 minutes) by tossing it in coconut oil, salt and pepper and arranging it on a tray lined with baking paper. While the veggies are cooking make the sauce by sauteing the shallot, lemongrass, salt, pepper, and red chili flakes for 5 minutes. Meanwhile, measure out ¼ cup of coconut cream and whisk in the arrowroot powder until completely dissolved. Transfer to a blender with the remaining coconut cream, shallot lemongrass mixture and basil and blend until creamy. After the cauliflower is roasted, toss with the baby kale. The kale will wilt from the heat of the cauliflower. Distribute the veggies between the baked sweet potatoes and garnish each with a few tablespoons of the sauce. As you can see, our hormones naturally shift according to our menstrual phases. We need to use our cycle as a guide so we can properly nourish our female bodies. Use the tips above to help you tune in and start Eating For Your Cycle! If you want to learn more or get more recipes, visit us on instagram @naturalhormonehealing or on her website, Natural Hormone Healing. 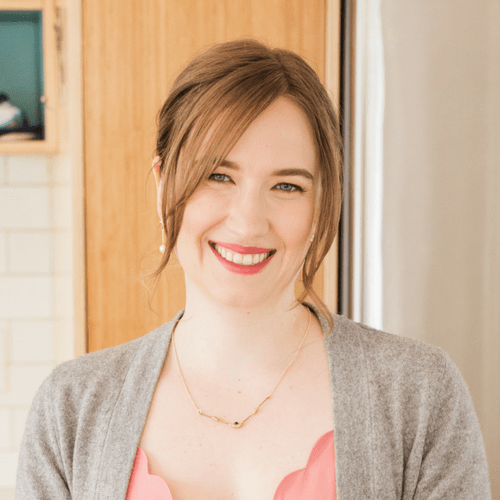 Madeline MacKinnon is the founder of Natural Hormone Healing and is a highly-sought after, leading expert in the emerging field of herbal culinary arts, elixir making and tonic herbalism. She dedicates her time, energy and education to help women from around the world to balance their hormones naturally without drugs. Her unique and effective system synthesizes the most cutting-edge discoveries in the field of nutritional technologies, super foods, traditional food nutrition and herbalism and combines them with the latest hormone testing, spa healing, and transformational coaching. It has been her great privilege to help women from all walks of life through preconception, postnatal, peri menopause, menopause, PMS symptoms, PCOS, Adrenal Fatigue,Thyroid issues and many other hormonally related health issues. Besides working with her own private clients, Madeline is also an instructor at The Light Cellar’s teaching kitchen in Calgary AB. She teaches classes on traditional food nutrition, elixir making, food as medicine culinary arts and natural hormone healing.